nice find, I have the white SRT, green Srt from HW, and a Silver from Matchbox. This is a nice looking car. My wife bought the the white version of that. I like it when she thinks about me. i have 11 new challengers and 5 old ones. plus some cuda's darts and chargers. my personal favorite is my "Snot Rod" from the movie Cars. And then there's my other 100 in package Ferrari's. Oh... i have an original 1968 edition 1967 Barracuda that's very cool. It's the same color as our 67 and everything. But boy they don't make hot wheels like they used to. More flash and less opening hoods and all that good stuff. But at least HW has started coming out with more and more old school muscle and stuff. Instead of all this crazy made up junk. Anywho... 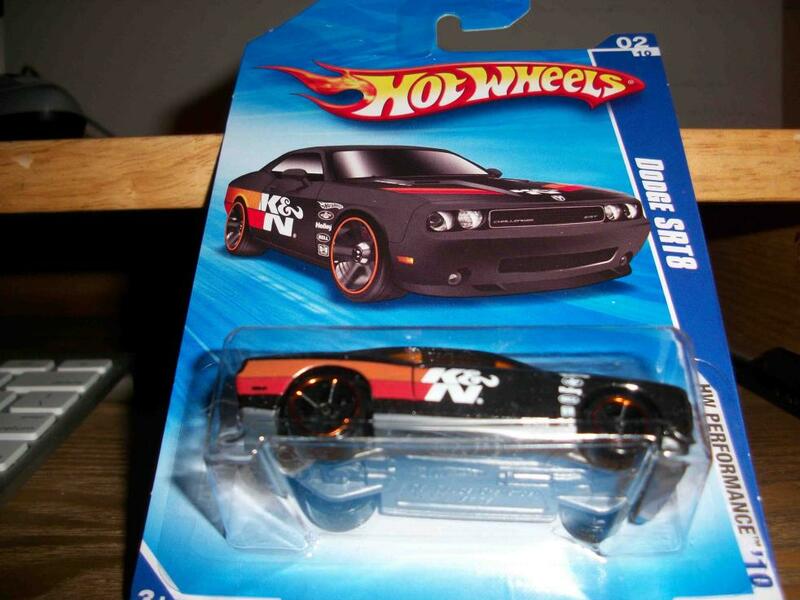 I have the K&N Challenger in white and black too. They're pretty slick looking. just got the white version of the K&N Challenger, found an orange version of the Matchbox Chally as well, hahaha my kids love it now, they have a complete car carrier full of Challengers. That's one of the good things about having kids, you can spent a lot of time in the toy dept.